For those who choose to spend their holidays in the Carpathians, be sure to pay attention to the local variety of outdoor activities, such as horseback riding. Communicating with these intelligent and kind animals give a lot of positive emotions, both children and adults. Also, riding has a positive effect on the whole body, because during the ride involved almost all muscle groups. There is nothing better than horseback riding in the Carpathians, where the charming nature will give everyone something — originality, extreme or touch of aristocracy. Despite the fact that horses are very smart and good-natured animals that never cause any harm to people, though they are much stronger than humans, so beginners recommended before the trip be trained on the basis of riding. Experienced Bukovel instructors will help novice to gain confidence and experienced — to improve their skills, and the horse will be obediently waiting for his rider and provide him a safe trip. Hotel complex Pidhiria offers unforgettable horseback riding, the prices are democratic and make this entertainment affordable for everyone. Our staff have developed special routes that will bring a lot of fun and adrenaline, both novices and professionals. All our horses have good manners and easy to cope not only adults but also children. So, you can have a good time with whole family. We have horseback riding, both for individual programs and for groups. Riding Horses Benefits your Health! 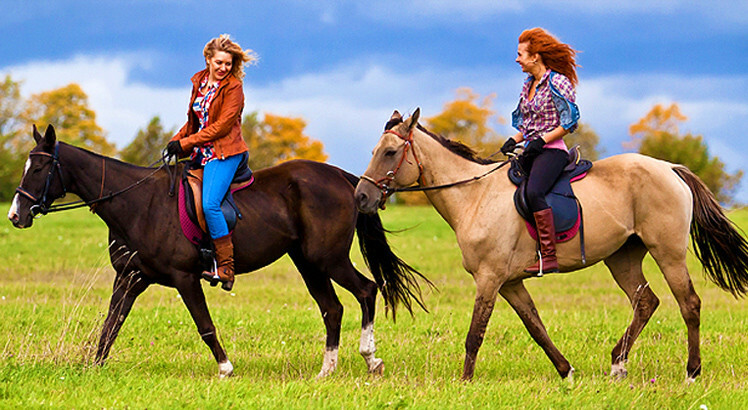 Equestrian by the vast spacious Carpathians will bring unforgettable emotions and stay in memory for a lifetime. A vast forests, rivers and mountains will make it possible to experience complete freedom and will distract from everyday worries. The beauty of the landscapes and amazing mountain climate contribute fully to devote yourself to the rest in Bukovel. Especially, young couples will enjoy this entertainment, as well as horseback riding to the slopes of the largest mountain in Ukraine will feel a real intimacy and romance. Even the smallest tourists will be delighted with such interesting and safe riding.